Complainants and implementing entities should use the implementing entity’s grievance mechanism as a first step. However, the Ad hoc Complaint Handing Mechanism (ACHM) of the Adaptation Fund can be directly used in cases where the Parties have failed to reach a mutually satisfactory solution through the implementing entities’ grievance mechanism within a year. 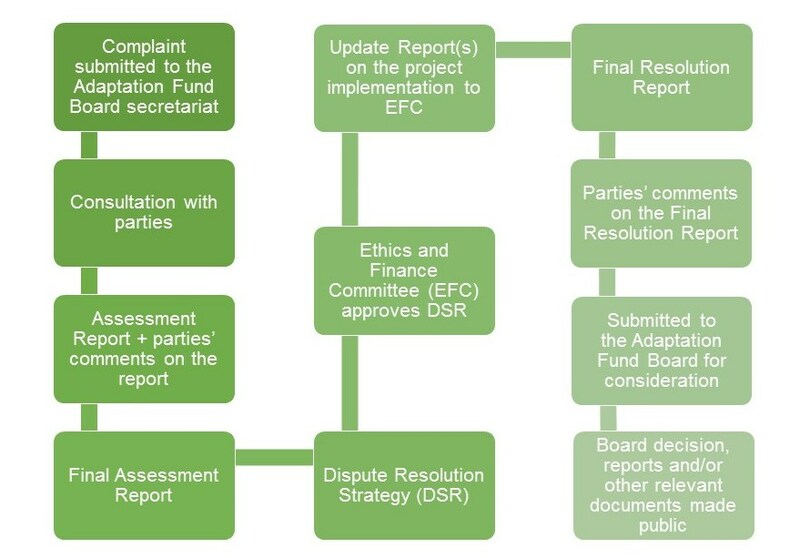 The Adaptation Fund Board Secretariat independently manages all aspects related to the ACHM, under the oversight of the Ethics and Finance Committee (EFC) of the Board. No specific form/format is required, but a complaint must be submitted in writing in any UN language (Arabic, Chinese, English, French, Russian or Spanish) either (1) by email to afcomplaints@adaptation-fund.org or (2) by hard copy to the Adaptation Fund Board Secretariat, 1818 H Street NW, N7-700, Washington, DC 20433, USA. Any individual or group of two or more people who lives in the project area and believe they are adversely affected by the implementation of projects or programmes funded by the Fund, or their duly appointed representative can submit a written complaint to the ACHM. Complaints can be sent up to the date of the submission of the final evaluation report of the project concerned. Complaint is submitted no later than the date of submission of the final evaluation report of the project concerned. Frivolous, malicious or vexatious complaints and complaints related to activities that have no relevance to the Fund-supported project are not eligible. Please refer to the paragraph 28 of the ACHM document for other ineligible claims. If complainants or their representative(s) believe that there may be a present or future risk of retaliation for raising their concerns, they can request confidentiality of their identifying information in a written complaint or in a writing at any time throughout the process. Description of efforts taken to resolve the complaint through the implementing entity’s grievance mechanism and of failure to reach a mutually satisfactory solution through the mechanism within a year. Please view a sample form of a complaint here. The ACHM process may start after the complainants and the implementing entity have used the entity’s grievance mechanism and failed to reach a solution within a year. The process may be discontinued at any stage should a solution be found or the case be closed for other reasons.